441, Lot: 415. Closing Apr 03, 2019 at 12:18:20 PM ET. Claudius. AD 41-54. Æ Sestertius (34mm, 25.18 g, 6h). Rome mint. Struck AD 41-42. 441, Lot: 420. Closing Apr 03, 2019 at 12:20:00 PM ET. Nero. AD 54-68. Æ Sestertius (35mm, 24.08 g, 2h). Uncertain Balkan/Thracian mint. Struck circa AD 63. 441, Lot: 429. Closing Apr 03, 2019 at 12:23:00 PM ET. Domitian. AD 81-96. Æ As (28mm, 10.94 g, 6h). Rome mint. Struck AD 92-94. 441, Lot: 434. Closing Apr 03, 2019 at 12:24:40 PM ET. Trajan. AD 98-117. Æ Dupondius (27.5mm, 12.94 g, 6h). Rome mint. Struck AD 98-99. 441, Lot: 440. Closing Apr 03, 2019 at 12:26:40 PM ET. Trajan. AD 98-117. Æ Sestertius (34mm, 24.42 g, 6h). Rome mint. Struck AD 114-116. 441, Lot: 443. Closing Apr 03, 2019 at 12:27:40 PM ET. Hadrian. AD 117-138. 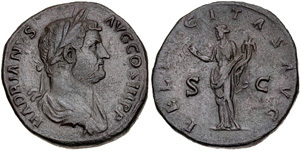 Æ Sestertius (30mm, 23.50 g, 6h). Rome mint. Struck circa AD 134-138. 441, Lot: 475. Closing Apr 03, 2019 at 12:38:20 PM ET. Philip I. AD 244-249. Æ Sestertius (31mm, 17.40 g, 12h). Ludi Saeculares (Secular Games) issue, commemorating the 1000th anniversary of Rome. 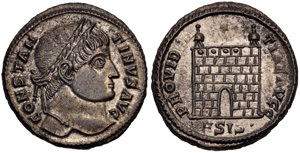 Rome mint, 6th officina. 10th emission, AD 249. 441, Lot: 492. Closing Apr 03, 2019 at 12:44:00 PM ET. Constantine I. AD 307/310-337. Æ Follis (18mm, 3.60 g, 12h). Siscia mint, 1st officina. Struck AD 326-327.